*Chef’s note: When cutting mint, stack a few mint leaves.Roll into a tight cylinder. With a sharp knife, slice crosswiseinto thin strips. 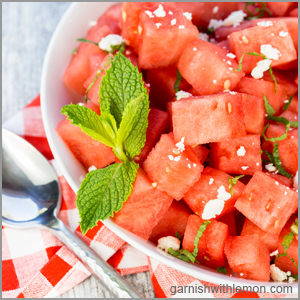 Cut watermelon into bite size cubes, gently toss melonwith rice vinegar, feta cheese and mint. Season with saltand pepper. Serve immediately.Serve and enjoy!